In honor of Earth Day I'm posting today about something near and dear to my heart. :) Cloth diapering. When I was pregnant with my first baby, my husband and I knew right from the start that we would cloth diaper. It just made sense to us. Our mothers had used cloth diapers on us and we were convinced they would be more comfortable and healthier for our baby. That was number one. High on my list was the fact that we would be sparing landfills a whopping 1 ton of trash by the time our son potty trained. High on my (very frugal) husband's list was that we would be saving ourselves over $3000 in those 3 short years. How can you ignore something like that? By the time we were bringing our son home from the hospital we knew all about the world of "modern diapering." Everyone we knew was envisioning old fashioned pre-fold diapers (which I still think are pretty cool and we even used them on our daughter for her first few weeks), pins, and plastic pants. Well if that is what you're thinking too, you are in for a surprise! Modern cloth diapers are nothing like the ones our mothers and grandmothers used. In fact they are really as easy to use as disposable diapers, often having an All-In-One or All-In-Two design. You can find them in loads of colors, styles, fabrics and even designer prints! 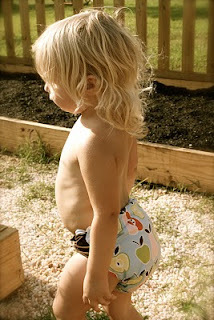 I was so inspired by cloth diapering that I began designing and sewing diapers for my son. This turned into a small business, now known as Urban Fluff. We're not so "urban" anymore, but I think my city roots are still there! That's the really wonderful thing about cloth diapering though. It doesn't matter where you live, or what you do, cloth diapering truly has a benefit for everyone. Modern diapers make it easy enough that even people who live in cities or moms who work outside the home can comfortably use cloth. It's just a matter of throwing in an extra load of laundry every day or two. It continues to astound me how people become more and more aware of cloth diapering every year. When we first started using cloth I would say to my husband, "If people just knew how easy it was, disposable diapers would rarely be used. If people just knew the cloth diapering options that are out there..." When I started using cloth I was the only person (in my social circle) who had seemingly ever heard of it. Now, almost everyone I know uses cloth. I worried that my husband might think it was fussy, but the times we have used disposables he absolutely detests disposable diapers! Once you use cloth there's no going back! Here are some pictures of my daughter in the iCandy Diapering System by Urban Fluff. You can purchase enough diapers to go from birth to potty for only $300. *Disposable diapers generate sixty times more solid waste than cloth. *Disposable diapers use twenty times more raw materials, like crude oil and wood pulp. *No one knows how long it takes for a disposable diaper to decompose, but it is estimated to be about 250-500 years under optimal circumstances, long after your children, grandchildren and great, great, great grandchildren will be gone. *Disposable diapers are the third largest single consumer item in landfills, and represent about 4% of solid waste. In a house with a child in diapers, disposable make up 50% of household waste. *Over 92% of all single-use diapers end up in a landfill. *Throwaway diapers use twice as much water as cotton diapers, mostly in the manufacturing process. *One ton of garbage is created for each baby who uses disposable diapers. *In 1955, before modern disposable diapers were sold and consumed, it was estimated that 7% of babies and toddlers had diaper rash. In 1991, long after plastic disposable diapers dominated the market, the number jumped to 78%. *Disposable diapers contain traces of Dioxin, an extremely toxic by-product of the paperbleaching process. It is a carcinogenic chemical, listed by the EPA as the most toxic of all cancer-linked chemicals. In small quantities, dioxin causes birth defects, immune system suppression, skin and liver diseases, and genetic damage in lab animals. It is banned in most countries, but not the U.S.
*Disposable diapers contain Tributyl-tin (TBT) a toxic pollutant know to cause hormonal problems in humans and animals. *Disposable diapers contain Sodium Polyacrylate, a type of super absorbant polymer (SAP), which becomes a gel-like substance when wet. This chemical can cause skin irritations and severe allergic reactions including vomiting, staph infections, and fever. LOVE THIS! Our Grandson Gryphon was in cloth diapers. Some were even homemade...so cute and so much better for Gryphon and the earth! "You can purchase enough diapers to go from birth to potty for only $300." This is incredible! Thank you SO much for sharing this post - such clear and valuable information! My daughter is now 6 months old and has been in cloth diapers since day one. She has not once gotten diaper rash. I love cloth diapers and will use them on all the other kids to come! Thanks for all the comments! What an adorable photo! It is so exciting to see so many people re-discovering cloth!